I really do see this stuff on a daily basis. I must admit that A Week in the Life found limited commercial success. That might be because it was released during the winter dump months. Or that might actually be because I don’t charge anything for admission. I have to do something about that. ;^) Regardless, it’s time for a summer sequel. In keeping with sequel tradition, I’m going bigger and badder by chronicling two weeks of summer life. Each day’s “special effects” are delivered via pictures and video. Hey… I’m on an indie budget here. At least the writing is inspired. Or at the very least, the writing won’t put you to sleep like a Kristen Stewart film. What it will do is open your eyes to what’s happening in HVAC every day of the the week and twice on Sunday. Hmm… I suppose that makes this a horror flick. Try not to scream. 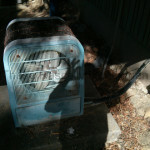 An old air conditioner, affectionately known as the “tombstone unit”, wasn’t working. The Requisition Technician visited some days ago. He diagnosed low Freon, told the homeowner that he doesn’t fix Freon leaks and left. That’s odd because A) I know Req Tech has fixed Freon leaks before and B) repairing Freon leaks is fundamental to this trade. Oh… and C? All he had to do was push the relay in and he would’ve noticed the failed compressor. The failed compressor means there was no need to worry about the leak. It also means there was no need for me to come out had he simply pushed the relay in. A ten year old air conditioner wasn’t cooling well. I got out there to find that its compressor had already been replaced once. They, whomever they are, didn’t bother to put the rubber feet on the new compressor. (Where you see bolts, you should also see rubber grommets.) It’s very noisy as a result. 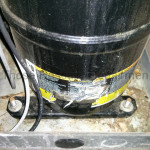 They also didn’t bother to vacuum the air out of the system when they replaced the compressor. The Freon circuit should only have, you guessed it, Freon. It’s no wonder the first compressor died an early death. Had I not been called out, the second one wouldn’t have lasted long either. 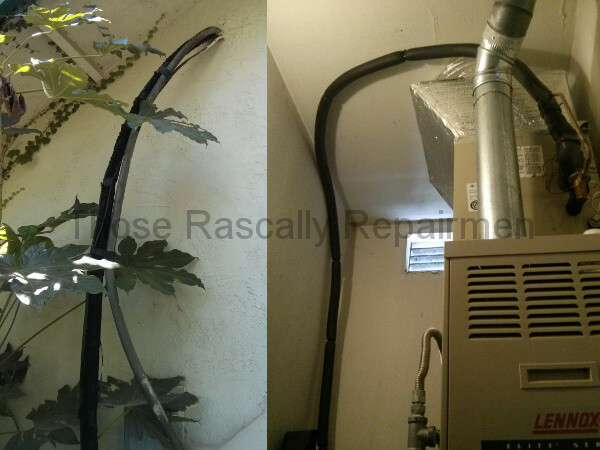 Fleeting Furnaces & Air was called to fix the air conditioner at a rental. They quoted the owner $150 over the phone and then charged her $250 for adding a single pound of Freon to the air conditioner. 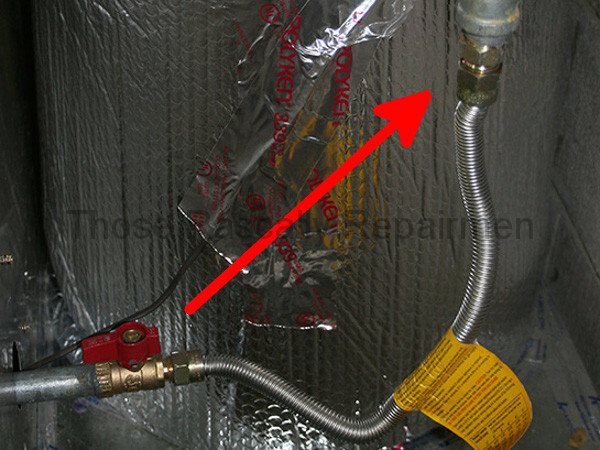 They made no attempt to find the Freon leak and, of course, recommended a new system. She then called me. 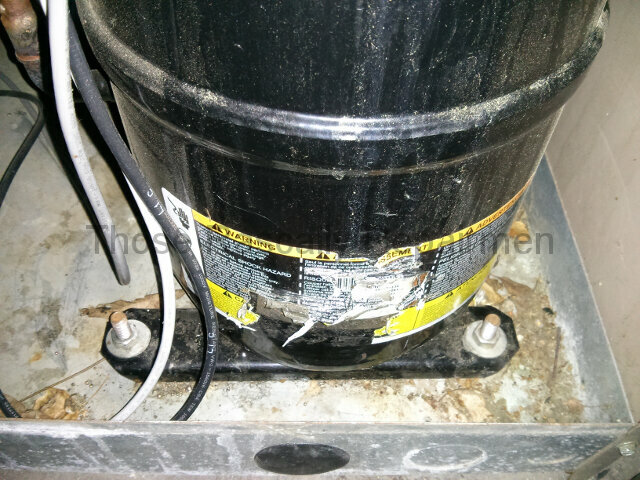 I found the leak, added refrigerant, added leak sealant, replaced a weak capacitor that they missed and installed filters that they left out – all for $350. A different air conditioner wasn’t cooling well because someone had filled it with twice the Freon it’s supposed to have. 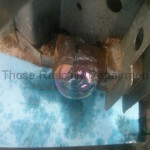 To understand why you have to understand that most repairmen working in HVAC are handy, but they’re not real tradesmen. The handyman pretenders charge ACs by pressure. 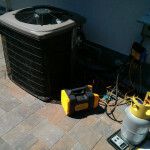 That worked on old ACs, but modern air conditioners must be charged by means foreign to them. As a result, the pretenders inevitably overcharge ACs. Many of them are licensed contractors by the way. 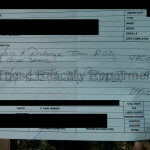 It’s not like a handyman has to prove HVAC competence to get an HVAC license. Day 4: Danger Will Robinson! Mad Hatter Heating & Air was certainly maddening. Their repairman showed in a car. He had to borrow the homeowner’s ladder to look at the ducts, after which he declared them a convoluted mess. He then got to the real problem, which was low Freon. He told her that Freon is dangerous and recommended a new Puron system for $15K. I got out there and found perfectly normal ducts. As for the “dangerous” Freon, Freon was invented precisely because it’s safe for use in home appliances. Puron may be better for the environment, but it’s no safer. And as for getting a new system, the old one is only seven years old! It has a lot of years ahead of it and is eminently fixable. We’ve got air again. I’ve been doing this for over twenty years. I don’t recall a confirmed case of major air contamination in an air conditioner during the first ten. Now I’ve seen it for a second time in a week. A homeowner had pavers put in. The paver guys knew a guy that could disconnect the AC so they could do their work. Can I tell you? The next time you hear someone say “I know a guy…” be very afraid. System pressures were all screwed up because the guy didn’t know to vacuum the air out when he reconnected the AC. It seems that Havoc Heating & Air has a hangup with Schrader valves. 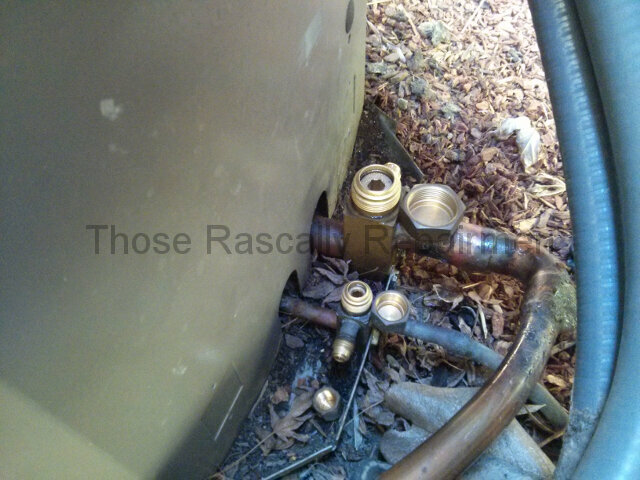 Last year they recommended an entirely new system to a customer when all her ten year old system needed was a new Schrader valve core and Freon. Today I’m adding Freon to a second system that they topped off last year. 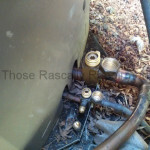 Had they simply tightened the second system’s Schrader valve caps and service valve caps last year, today’s several hundred dollar expenditure wouldn’t have been necessary. It’s enough to make you cry havoc. Ach Tune Air needs some fine tuning baby. An air conditioner wasn’t working because Ach Tune connected the wiring incorrectly on a furnace that they installed last winter. While it’s great that Ach Tune pulled a building permit for the new furnace, they forgot to call the inspector out. It’s a good thing they forgot because there were a few code violations that only a newb working without any supervision whatsoever would make. The incorrect control wiring isn’t something the inspector would’ve cared about, but putting the gas valve on the wrong side of the flex connector is! 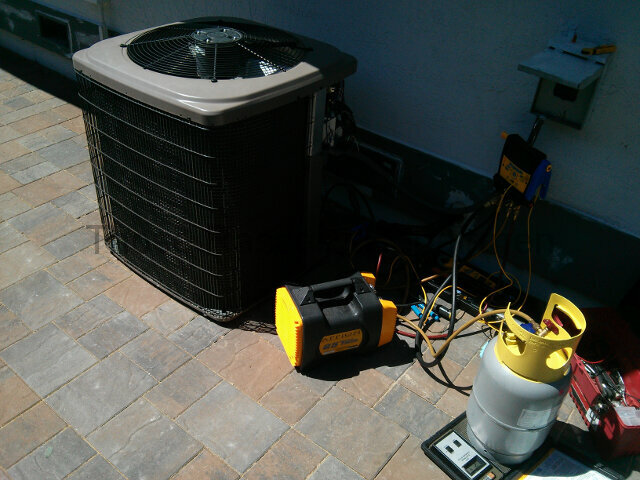 A homeowner’s air conditioner lost all of its Freon again. A repairman looked for a Freon leak last year but couldn’t find it, so he just filled it with new Freon. I’d have a hard time finding leaks too if I was using Windex! Seriously. The customer watched the repairman look for leaks with Windex. My electronic leak detector picked up the leak at a service valve immediately. I then put liquid soap on the valve and it bubbled profusely. A little Nylog and the turn of a wrench was all that was needed to seal that leak. Call one had me looking at an air conditioner that was low on Freon. It was just filled last week by another company. It’s obvious that they made no attempt to find the leak or, perhaps, they’re not even equipped to do so because I found the leak in minutes. That might be due to the fact that I have three electronic leak detectors as where many repairmen, like Windex Man from yesterday, have none. 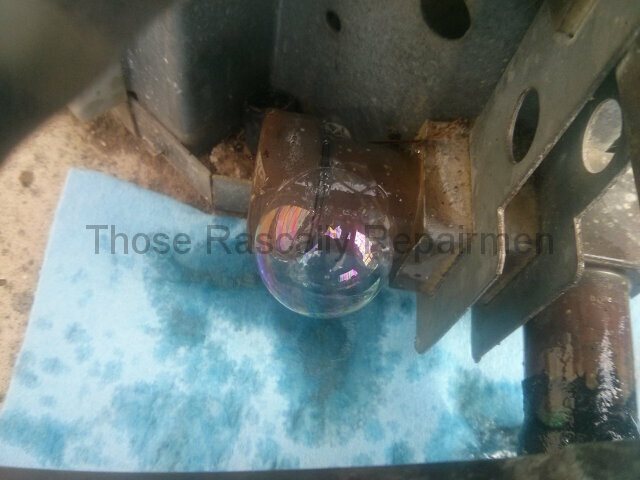 Anyway, it’s one of those rare leaks that can’t be fixed – meaning the hundreds that the homeowner spent last week have floated away with the Freon. Call two was for a system that wasn’t working at all. The fuse had blown because a capacitor wasn’t strapped down. The capacitor had vibrated its way to the right and shorted against a relay, thereby blowing the fuse. 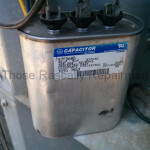 That capacitor was installed by a home warranty contractor two years ago. That supposedly two year old capacitor had the wrong voltage rating, was already weak, looked beat up and had a manufacture date from 10 years ago. The “0437” on the sticker indicates the capacitor was made in 2004. Me thinks they installed a used part. Call three was for low Freon. Again with the Freon! 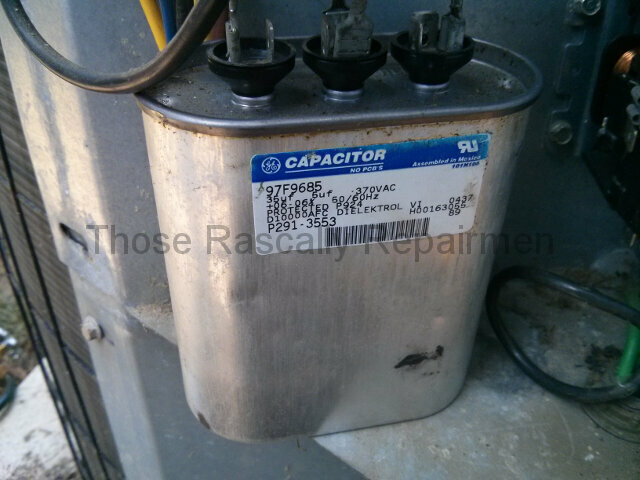 An air conditioner repairman’s summer is all about capacitors and Freon. 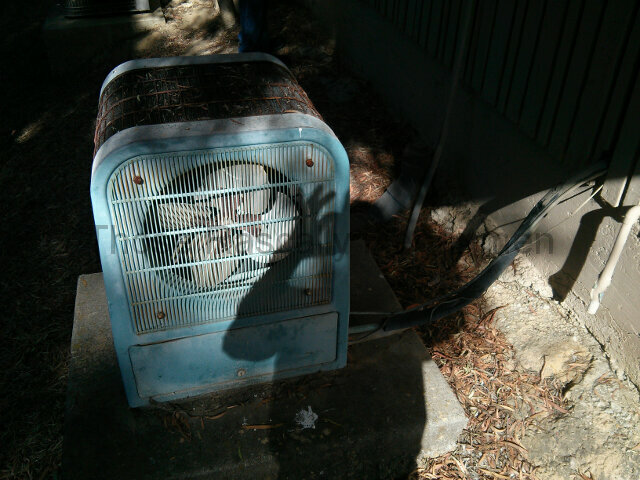 Hegemon Heating & Air had topped the Freon off without fixing any leaks. I found and fixed one leak, added a shot of Freon and added leak sealant just in case. I also measured SH, SC, ESP, TD and amp draws. 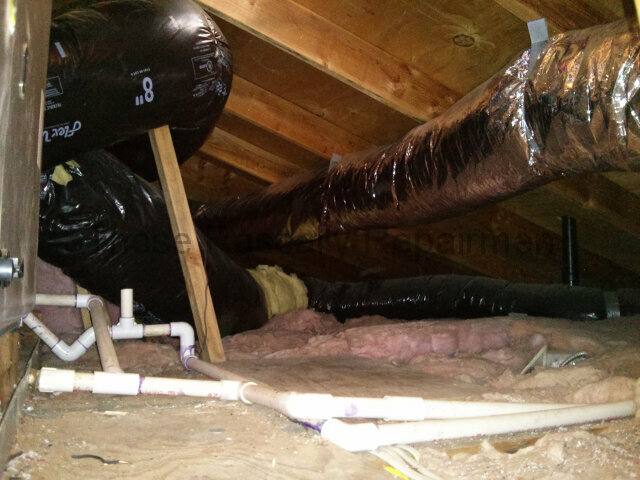 I then checked the ducts in the attic, replaced a capacitor, replaced the filters and corrected the blower speed. I did all of that for less than Hegemon. 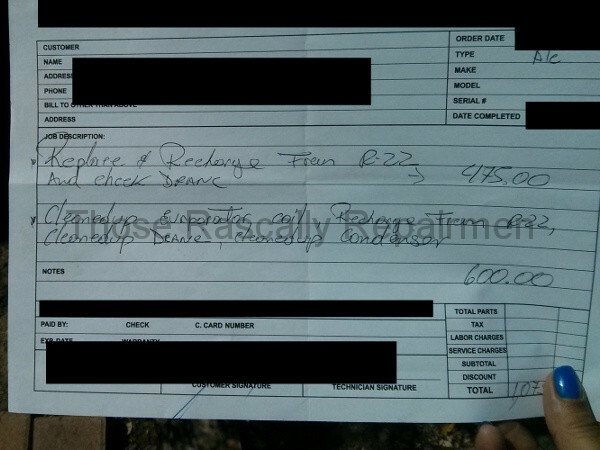 Like most contractors, their low trip fee makes them seem cheap while their repair fees are unseemly. As you might’ve guessed, that’s not my hand holding the invoice. Blue isn’t my color. It’s mostly quiet on the HVAC front today, with the exception of a couple of minor skirmishes. 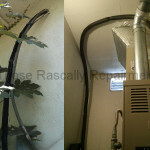 I came across two air conditioners with dangling refrigerant lines. It’s funny how things come in bunches. The first set of lines could kink where they exit the wall. In fact, they may already have. I didn’t check because they’re going to be replaced anyway. The second set is supported entirely by its soldered connections to the cooling coil and air conditioner. There’s nothing in between. Whoever installed the second set of lines curved them beautifully. It’s too bad they didn’t bother to strap them up. 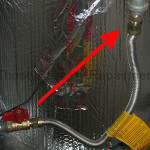 The stress on those connections could eventually result in an expensive Freon leak. There isn’t enough time in the day to chronicle every code violation I come across. The majority of HVAC systems do, in fact, violate code in one way or another. That tells you how many contractors actually pull permits. That also tells you how important the installing contractor is. Given the plentitude, I save the code violating reportage for when it’s especially plentiful or relevant – like today. A written summary follows. The slide show below it tells the tales even better. Call one had me playing the contortionist as I tried to service an air conditioner that’s facing the wrong way. 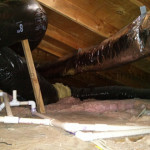 Call two had a water leak in the attic caused by a fitting that the installers didn’t glue. It had been that way for years before it finally started to leak. Call three’s furnace was spilling exhaust gas into the home because the installers mixed two brands of exhaust vent. They didn’t bother to install a gas valve on the flex line either. Call four had me all twisted up again. The refrigerant lines are even more twisted than I was. There was a time when repairmen were repairmen and homeowners were glad of it. Well… maybe. I don’t know if that was ever really true. It’s certainly not true now. As I mention on day nine, the lack of real tradesmen means most HVAC systems violate code in one way or another. And of course, some systems are worse than others. The first furnace in the slideshow below qualifies as “worse”. It appears that Mountebank Mechanical installed it. I say “appears” because their sticker is on it and because it looks like their work. I admit that’s circumstantial evidence, but I know the look. Mountebank has been installing like this for years. As for the second system, I owe that visit to our old buddies from Hindrance Heating & Air. Just as it was with A Week in the Life, I didn’t pick these two weeks in my life because they were worse than normal. I picked them simply because I had the time and motivation to write. I could pick any ten days and have just as much to write about. Of the forty calls I ran during these two weeks, half have an entry. Count only new customers and three-quarters have an entry. I knew it was bad, but it’s even worse than I thought. Don’t let reality bring you down. It is indeed very bad out there. But you’re here, which is very good. Get informed about HVAC and might avoid becoming an unwitting extra in the next chapter of this real life serial.